Description: Perennial herb 30–100 cm high, glabrous; stems branched, hollow, striate to furrowed. Leaves below water 3–4-pinnate, those above 1-pinnate, 12–22 cm long; leaflets 15–21, oblong-lanceolate or ± ovate, 1–4 cm long, toothed, sessile. Umbels 3–6 cm diam. 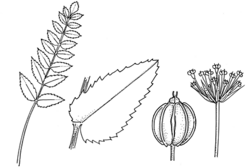 ; peduncle 3–8 cm long; bracts 4–7, lanceolate, uneven, 10–12 mm long; rays 6–20, unequal, to 20 mm long; umbellules 6–12 mm diam., bracteoles linear or lanceolate, 2–3.5 mm long; pedicels 9–22, to 5 mm long. Petals c. 1 mm long, white. Fruit broad-ovoid, 1.5–2 mm long; mericarps with 5 prominent ribs. Distribution and occurrence: Grows in swamp areas and shallow water lakes, south of Casino-Tamworth areas. Native of Eur., W & C Asia, N Amer. Other Australian states: *Vic. *Qld *S.A. *W.A. Considered to cause deaths in cattle if eaten. This species is often confused with Helosciadium nodiflorum which has 0–2 bracts at the base of the umbels and is not considered to be poisonous.